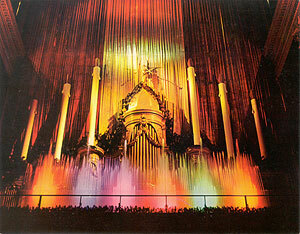 The Wanamaker Organ Case with the Enchanted Fountains. The Wanamaker Grand Organ now at Macy's has been thrilling Philadelphia shoppers and visitors every business day since 1911. Eighty years later, in the fall of 1991, an organization of the Friends Society was formed to support the preservation and musical mission of this irreplaceable American treasure. Built by the Los Angeles Art Organ Company for the 1904 St. Louis World's Fair, the Wanamaker Organ was designed by renowned organ architect George Ashdown Audsley, author of The Art of Organ-Building. This heroic instrument had more than 10,000 pipes, and its construction was on such a lavish scale that costs soared to $105,000, bankrupting the builder. In 1909, Philadelphia merchant-prince John Wanamaker bought the instrument for his new Philadelphia emporium. Thirteen freight cars were required to ship the entire organ from St. Louis, and installation took two years. The Grand Organ was first heard in the Store's seven-story atrium on June 22, 1911, at the exact moment when England's King George V was crowned at Westminster Abbey. Later that year, it was prominently featured when President William Howard Taft dedicated the Store. Note: The above descriptive information came from the organization's Support the Friends of the Wanamaker Organ page.